Fuel tank has dent and needs to be repainted. Inside isn’t rusty, but it has plenty of crud hanging around. Fuelcock has a slow leak when in the reserve position. All electronics on the fritz. Need to check all switches wires etc. I would like to move the ignition back to the handlebars where it belongs. Fuse cover missing, as is one fuse. Wonder if this is the fuse keeping all my switches from working? The rest is cosmetic. Taillight is busted and needs to be replaced. Right sidecover is missing a tab and won’t stay on the bike. This was one long excruciating drive. I enjoyed seeing my family in Phoenix, but I was only there a few hours. The hours that weren’t spent sleeping I spent as a walking zombie. I left Saturday evening at 18:45 and drove 17hours and 45minutes straight. The return trip took 20 hours, but that included a nap in a picnic area 40 miles north of San Antonio. After a few hours sleep the bike is loaded up while my Grandfather looks on. I feel confident with his supervision. He’s a retired professional engineer and consultant on “vast and half vast projects”. Time to turn around and head back. My poor 4cyl truck just wasn’t making it up these mountains against a stiff headwind carrying a 500lb bike. Shadow showing the bike in the back of my truck. Très artistique, no? 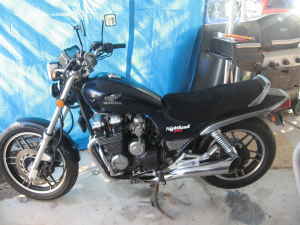 On October 21, 2007 I purchased this ’83 Honda Nighthawk 650 from an ad in Craig’s List. The bike had a few problems with it. It had been sitting since ’04 in a backyard shed. The clutch master cylinder needed to be rebuilt. It had a couple electrical problems, such as the turn signal switch, ignition switch, etc. Some dents, dings, and dust needed to be taken care of. And the biggest problem of all; The bike was in Phoenix, not Houston. First step, travel to Phoenix and bring back the Bike.